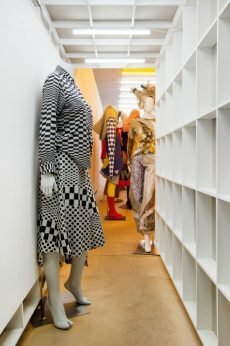 In a multidisciplinary exhibition titled Overworked Body: An Anthology of 2000s Dress, fashion curator Matthew Linde presents clothing design in a new light. 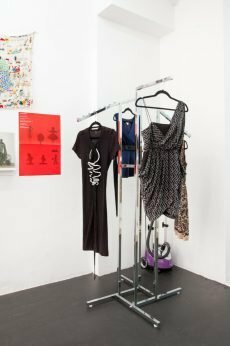 Initiating a presentation hosted between the East Village MINI, Goethe-Institute Curatorial Residence and Matthew Gallery, looks including As Four, BLESS and Issey Miyake were positioned throughout the space in unconventional ways. 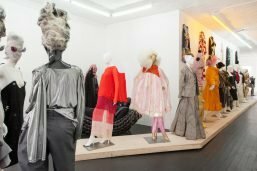 Displays were fashioned on diva mannequins standing on, underneath and beside a wooden ramp at the 38 Ludlow exhibitions, and juxtaposed – as simple as presented in retail fashion, from a hanger, or extravagantly as laying in a hammock at 46 Canal. From the Walter Van Beirendonck knit pomp pomp hemmed dress to the mini floral printed lace Rodarte for Target dress, such pieces displayed among fashion films and texts including MADEinUSA and Self Service Magazine. Speaking with Matthew Linde about the display encouraged my spirit for the future of fashion. 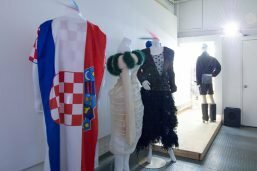 He spoke with great enthusiasm about the fresh perspective on experiencing clothing design: one that allows a guest to interact close and personal with the garments, rather than from an onlooker’s view on the runway or in a museum, from afar. Linde desires for breaking the formalities of exhibiting fashion. Closing the exhibition was a fashion show that brought the still mannequin pieces to life. The ramp installation became a runway platform concluding a show walked from the city streets between 46 Canal to 38 Ludlow. 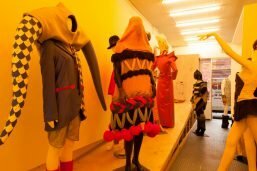 A week later, Linde invited the public to 80WSE Gallery, just short of the east side of Washington Square Park for a third installation focused on fashion films. Passing beside an open bar as I walked to the exhibiting space, I soon realized it was party time. 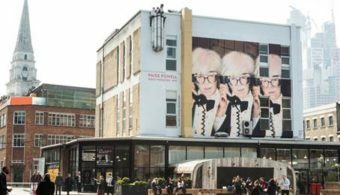 Steven Warwick tracks created the mood as films projected on the plain walls casting screens of bootlegged fashion films. The screenings for the night included runway performances of the 2000s: Hussein Chalayan’s 2004 “Ballons,” Adeline Andre 2009 Collection of models dressing on the runway, and Imitators of Christ view of social culture. These films were chosen as another media that creates conversation about how fashion is conceived and purposed. Dressed in black, Linde approached the crowd in a persona pushing a cart with a standing girl in white. The outfit’s accessory, a necklace of three-painted blue ice cubes dripped onto her blouse, floral skirt and platform. 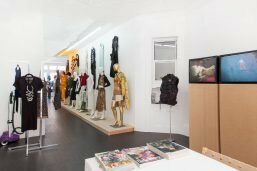 An ode to Margiela’s Spring/Summer 2006 collection, as I watched, this became clear: Matthew Linde creates an experience of fashion recently forgotten. Regarded as “overloaded and overworked,” the 2000s period of fashion history employs multiple medias to approach an expression of identity with extreme creative freedom. Maximalist of mix prints, spinning and reoccurring images captured on film and high fashion- meets- fast fashion collaborations gather as outlandish and unorthodox encounters of fashion. Linde pays homage as he seeks to understand.